LSG Sky Chefs’ Chef Competition: Butter or Olive Oil? Who will prevail when a butter person and an olive oil fan battle it out? Scientists, nutritionists and health consultants tend to prefer one product or the other, depending on lifestyle as well as dietary trends. In regards to butter and olive oil, one thing is certain: Both products have a very long history and are an essential part of different cultures. Nicholas Vass calls himself a butter person, whereas Erich Ruppen is a fan of olive oil. Both work as Executive Chefs at LSG Sky Chefs. Nick: Butter is a universal good and is used in almost every culture. Legend says that it was invented by accident when travelers on horseback carried fresh milk in goatskin bags behind their saddles. The movement of the horses created a churning that resulted in butter. Of course, this is not the way we know and produce butter today, but I really like that it is such a natural product which can be produced from all sorts of milk. It always has this luscious mouth feel that gives a rich and creamy taste to everything it touches. Erich: Olive oil is also a pure natural product with a long, long history. The olive was native to Asia Minor and spread from Iran, Syria and Palestine to the rest of the Mediterranean basin around 6,000 years ago. It is among the oldest known cultivated trees in the world, being grown before written language was invented. It also comes in different flavors. A Turkish olive oil, for example, has a very delicate flavor. It’s smooth, with a golden color and a low acidity level. It’s gentler than the olive oils from Italy or Spain. 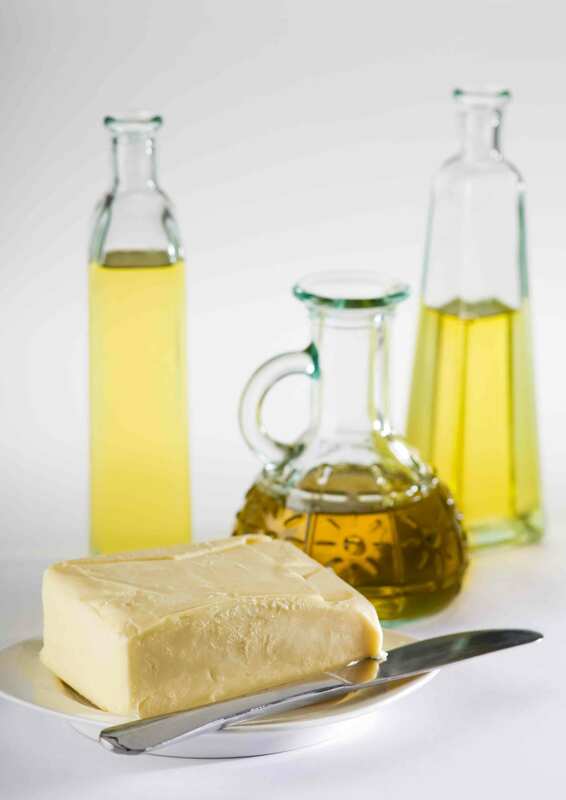 Which cooking attributes make either butter or olive oil the better product? Nick: For me, butter has a richer taste profile, delivers more flavor and has the ability to bind with so many other ingredients to create specific dishes. In comparison to olive oil, it’s by far the better and more versatile product. Erich: But olive oil is the ideal product for salads and cold starters. It is also the healthier option as it is made from a tree-growing fruit. Beyond the flavorful taste, there are many health benefits of olive oil. It’s naturally free of cholesterol, trans fat, salt, sugar, and gluten. In addition, olive oil is rich in monounsaturated fat. Butter, on the other hand, contains more saturated fat. Butter is for baking and olive oil is for cooking, right? Erich: Well, yes. I prefer olive oil for cooking. Oil has a higher smoking point, which makes it more suitable for frying. I prefer a smoking point of about 200°C and not just 155°C. The high temperature ensures fast browning (also known as the “Maillard reaction”) and makes sure that the meat will taste delicious in the end as it has a crispy texture outside and is tender and juicy on the inside. And just imagine – adding a few drops of olive oil gives a pizza an incredible finishing touch. Nick: I would not agree on this in general as butter can be used in so many different ways. In my personal opinion you can’t make the best sauce without butter. In fact if you switch butter for olive oil in this sauce you would just have warm mayonnaise. Yes, you got it, I am talking about the king of warm emulsion sauces, Sauce Hollandaise. So, which product is better overall? Erich: In regards to airline catering we use both products and highlight their specific attributes. We garnish and enhance appetizers, for example, with olive oil. However, we also need butter to keep meals moist and bring out the flavors in meats and vegetables. Of course, we need to control the amounts of butter used to ensure the overall healthiness of our dishes. Nick: There are still many arguments about how butter is better than olive oil for the human body and vice versa. But, in my opinion, it all comes down to how you live, how you balance your diet, the environment around you and the quality of the product. These days it’s a personal choice.